The idiom “like the fox guarding the hen house” is meant as a warning — foxes eat hens, so putting one of them in charge of the chickens’ security seems like a foolproof way to end up with a lot of dead chickens. It’s a useful idiom, one employed in many editorial cartoons. And it’s also a good thing to remember if you’re in Switzerland and want to stem the tide of rabies. Rabies is a viral disease which is spread to humans via the saliva of an infected animal, typically when an such an animal bites a person. If the disease is treated early, it is 100% curable. If you’ve been bitten by an animal which could be a carrier, doctors will almost always treat you for rabies as a cautionary measure. That’s because rabies can’t be diagnosed in humans until the major symptoms are present — “violent movements, uncontrolled excitement, fear of water, an inability to move parts of the body, confusion, and loss of consciousness” per Wikipedia — and, by then, it’s too late. Those symptoms occur when the virus has reached the person’s central nervous system and at that point, the disease is almost always fatal. Rabies claims the lives of as many as 50,000 people worldwide each year, the vast majority of which are in Asia and Africa. The best defense against rabies, therefore, is a good offense — get rid of it before it strikes. Modern medicine has an effective preventative measure at its disposal, too: a live-virus vaccine which can be administered to rabies-prone species. Dogs, for example, are often carriers of the disease (you’ve probably heard the term “rabid dog” before), but in the U.S. and in many other places around the world, almost all of them have been vaccinated against it. The most likely animals in the Americas to spread rabies to humans — bats (by a large measure) and raccoons — are much harder to vaccinate as they’re not domesticated, but bites from either are generally rare. (That said, the CDC advises that you seek medical attention immediately if you have any reason to believe you’ve been bitten by a bat.) In Europe, when it comes to rabies, its foxes that are of particular concern. Foxes, like raccoons, are difficult to inoculate as they’re not often domesticated. And in the early 1980s, they were a breeding ground for rabies. 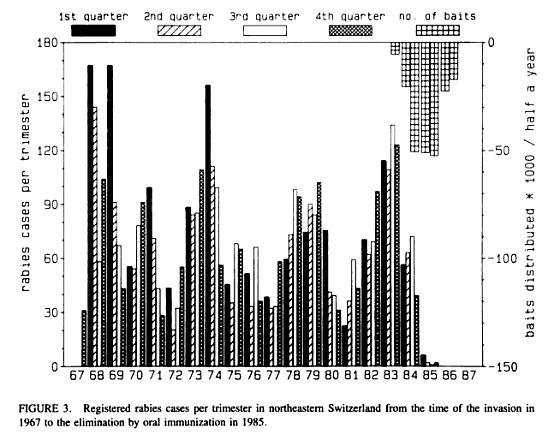 According to the New York Times, “in the first quarter of , 5,640 cases of rabies were reported in animals in Europe,” a number which was “up substantially from the 4,280 cases in the previous quarter.” Switzerland was particularly concerned, as it had seen rabies cases fall slowly from its peak in the late 1960s, as seen in the graph below (via here), but was starting to see the numbers come up again — and it wanted to stem the tide. And, as that graph shows, Switzerland did in fact find a way. By 1985, rabies was virtually unheard of in the monitored region of the northeastern Switzerland; by 1986, there were no reports of the disease in that area. The foxes were asked to guard the hen houses — kind of. Foxes, again, like to eat chickens, and Switzerland used this fact to the advantage of public health. As the Times further noted, the country dropped tens of thousands of chicken heads into the areas where foxes tended to live, providing the animals with a tasty, crunchy, and favored snack. But these weren’t ordinary chicken heads. Hidden inside: the rabies vaccine. For the already-infected foxes, these treats came too late. But those who had not yet been exposed to the virus were, like dogs, armed with antibodies to fight off the disease before it could (pardon the pun) roost. Bonus Fact: In 2004, a 15-year-old girl from the Milwaukee, Wisconsin area was bit by a bat but did not seek treatment for rabies. She was never given the rabies vaccine and by the time she developed symptoms of the the usually-fatal disease, it was too late. But she survived, becoming the first unvaccinated person to do so. The treatment, as the New York Times reported, was aggressive, to say the least: they put her in a coma and then treated her with various anti-viral medicines while she was in that state. As one doctor explained, “evidence suggested that rabies did not permanently damage any brain structure. Instead, death comes because the virus seems to cause temporary dysfunction of brain centers that control critical functions like breathing and swallowing.” The coma, effectively, protected the brain during that risky period. From the Archives: Seeing Red in the Hen House: Why chickens used to wear sunglasses. Related: A chicken head for your head.